At The Beach Rooms we have created an exclusive and versatile space for you to enjoy. You will have uninterrupted, stunning views of the sea from the lounge room and patio while the extra features we have installed will enhance your stay. The accommodation comprises of a double bedroom, a separate lounge, bathroom with bath and shower, separate WC and a patio area with secure private garden and your own entrance. 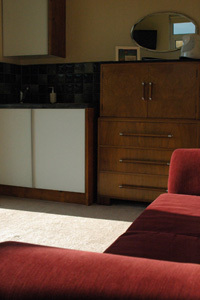 Lounge – Enjoy the dramatic coastal scenery whilst relaxing or eating breakfast in your own private lounge! 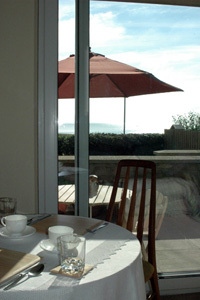 The double glass doors give you fantastic sea views and lead out onto the patio area. We decided you will certainly want to relax in this space so we have provided a sofa, table and chairs, a sink with wash-up area, a small silent refrigerator, glasses, mugs, plates, cutlery and a selection of useful utensils. Of course we haven’t forgotten hot drinks so a kettle and top quality tea and coffee are on hand. For entertainment, you will have a digital flatscreen television with freeview, board games and a small library of books. Bedroom – A restful night’s sleep is assured in your top quality king-size bed. The light, airy room also has a digital flatscreen tv and a built in wardrobe. 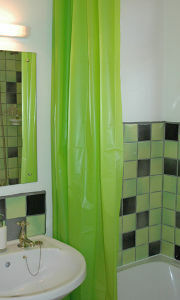 Bathroom – bright and fresh with a bath and shower it also includes a sink, mirror and medicine cupboard. 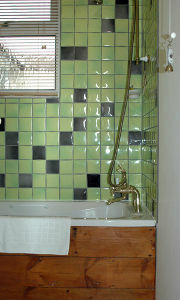 WC – separate Toilet with sink and mirror. Patio and private garden – Access to your patio is via the lounge. 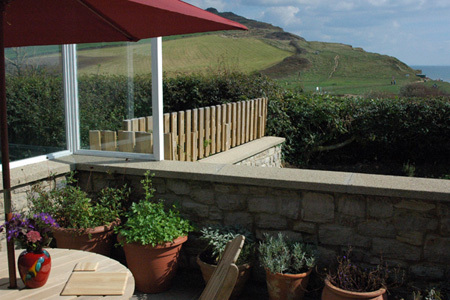 There are magnificent sea views from the patio and a few steps take you down into a small, secure garden.